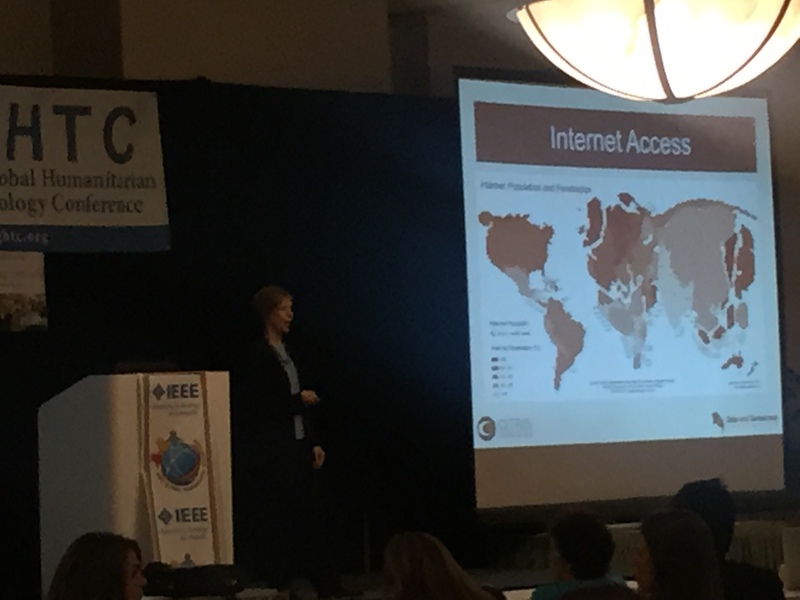 On Oct. 18th, 2018, a welcome reception for the IEEE GHTC 2018 attendees was co-hosted by the IEEE Santa Clara Valley – Young Professionals, and Women in Engineering chapters. The highlight of the reception was the inspiring keynote presentation by Ms. Erna L. Grasz, Founder and CEO of Asante Africa Foundation ( www.asanteafrica.org). She facilitated a thoughtful conversation on Getting Your Humanitarian Innovation Funded. Although there have been many well-intentioned donations from the USA to Africa, some of them may not meet the needs of the local community. Many of us here in the Northern half of the globe would like to be a partner to make the world a better place for children and communities in the southern half of the globe, yet sometimes we are not approaching it in a partnership manner. For example, thousands of mosquito nets were air-dropped into locations where there was no problem with mosquitoes. Engaging the local community early and often is essential to “doing good, not just feeling good”. Alongside the development of technologically innovative solutions for the developing countries, it would be necessary to develop a business model framework to navigate to a sustainable business. Today’s thought leaders indicate that the traditional level of business plan details are not so realistic for a new innovation in a new market, so business models are taking their place. Business canvas model is readily being used for new entrepreneurs locally and globally. It is now a popular tool for developing the business model framework. AirBnB is one of the well-known companies that has adopted business canvas model to initially launch their business. Venture funding may be scarce for social impact businesses, as there is usually an expectation for a hockey stick growth projection. At least initially personal funding and crowdsourcing appear to be the way to go. During the offline Q&A, Erna confirmed the possibility of bringing innovations that are developed for the low resource regions back to the US, which can solve similar problems in the US – in a hockey stick shape, perhaps. Every start-up CEO requires a team around them, with complementary skills, ideally. Thus you should know your strengths and weaknesses, and what other talents you need to make the business stronger. The video: “Africa-your voice matters” carries an important message that the World needs new speeches and that those new speeches will come from this new young generation – to lead everyone towards building a better World for a new generation. There are no limits on what you can do, when you are able to see yourself as that global change agent. Acknowledgments to Ms. Erna L. Grasz for her comments and suggestions to improve the original draft of this blog. 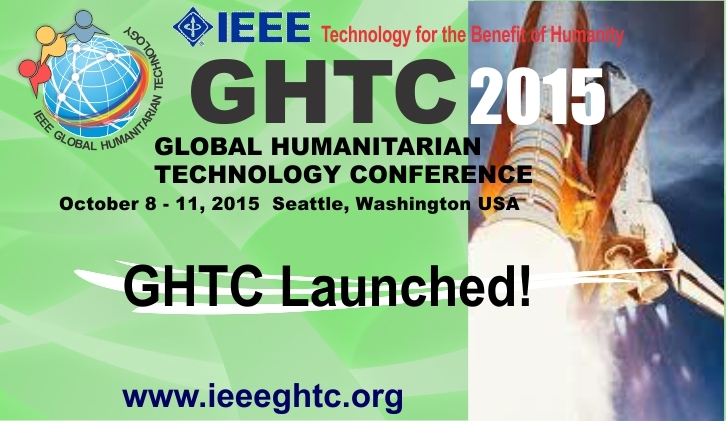 The Global Humanitarian Technology Conference (GHTC) is the flagship IEEE conference for presenting, discussing, and developing technological solutions to global humanitarian challenges. GHTC invites presenters and attendees who work to meet the needs of populations affected by poverty, disaster, conflict, environmental change, and other impacts resulting in their needs being unmet or underserved. The conference’s focus is to create and promote appropriate, sustainable, and holistic solutions to humanitarian challenges by integrating technical science with broader disciplines such as economics, policy, culture, and environment. GHTC encourages practice and research oriented engineers, scientists, and practitioners with both technical and non-technical backgrounds. We welcome a diversity of participants from academia, for-profit and non-profit business, governmental and non-governmental organizations to present research, lessons learned, case studies, ideas, and other considerations for the creation of effective humanitarian technology. Authors may submit content in the form of a technical paper, poster, or special session (panel, workshop, or demonstration). We especially encourage the inclusion of practitioner’s case studies to be included in this year’s practitioner forum, and are seeking proposed technical challenge statements for this year’s hackathon. Please see the links below for more information. * International attendees are responsible for obtaining the proper visas; the conference will send a standard invitation letter on request. Accepted and presented papers will be published and included in IEEE Xplore. Electronic media containing all accepted GHTC abstracts and papers will be distributed to registered attendees. Health emergencies – Ebola, H1N1 etc. 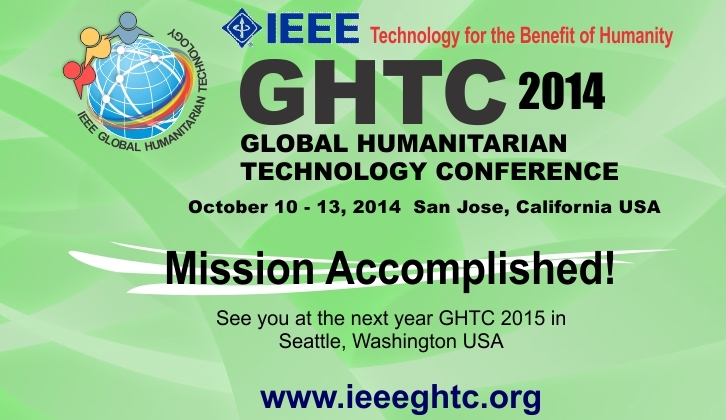 Thank you everyone for attending and/or following us during the course of GHTC 2014. We could not have achieved so much without your support! See you in 2015! Robert Melich, co-President of Agile3D Technology, has attended a lot of conferences. A lot. This was his first time at GHTC. What did he experience and how does GHTC differ (in a good way) from other conferences on similar same topics.